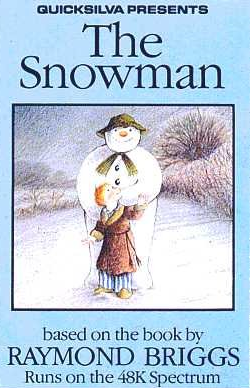 Based on the book "The Snowman" by Raymond Briggs. Developed by David Shea for the ZX Spectrum in 1983. Converted for the Commodore 64 by Robert Harris in 1984. Also converted for the MSX in 1984, but the credits are currently unknown. It's time to start the 2015 Christmas season proper, and this time I shall be getting into another suggestion (or was that a request?) by a reader - I think it was Alessandro Grussu who mentioned this one last year. To be honest, I wasn't too aware of this game, until mr. Grussu suggested the game, so I had to take a proper look at it. The World of Spectrum users have given 23 votes for their version, rating it with a total score of 7.67, which isn't too bad. At Generation-MSX, the game has 9 votes, with a rating of 4 and a half stars. Curiously, the C64 version has no scores whatsoever anywhere - the Lemon64 archive doesn't even have this game in its database, nor does MobyGames. I guess my lack of knowledge in this case mirrors the overall C64 population's, since I originally became aware of this game's existence due to extensive browsing of the WoS archive, but never paid much attention to it. So, let's see how this turns out. My first impression of the game was, naturally, based on the screenshot at the World of Spectrum website, in which the game looked more or less like a variant of Chuckie Egg or perhaps Burger Time. My first test of the game didn't much improve my opinion of it, so I acquainted myself with the contents of the game's instructions manual at the back of the tape cover, to see if I was missing anything important. Sure enough, there was some actual progression in the game, even though the basic gameplay remains the same throughout the game. You walk around and climb ladders, collect parts of the Snowman and bring them to the spot where he's being materialized. There are four stages in the game, in which you need to collect different things for the Snowman: six pieces of snow in stage 1, his decorative elements in stages 2 and 3, and six ice cubes in stage 4 to keep him from melting down. The latter stages are only repetitions of the same idea with different level layouts. Although the gameplay resembles Burger Time for the most part, there is a bit of Pac-Man here as well: you can collect certain special randomly appearing items to get yourself some time to freeze a monster for a little while. Also, you need to keep an eye on your hunger level, which depletes constantly as you work, so you need to pick up food items every now and then not to starve to death. For a game based on a rather wondrous little children's tale with no spoken words, I have to say the game concept is a bit too peculiarly one-tracked for my taste. Sure, the idea of building the Snowman and keeping him sort of alive is part of the whole idea, but too little of the tale's narrative was exploited here to make it particularly interesting. Still, as far as Burger Time variants go, the Snowman is far from being the worst of the lot, and as mr. Grussu suggested, it's one of the better games to have a go at during the Christmas season. Once again, as I couldn't locate proper tape image files for all the versions, I had to skip the Loading section for now, and start with something that's really important. 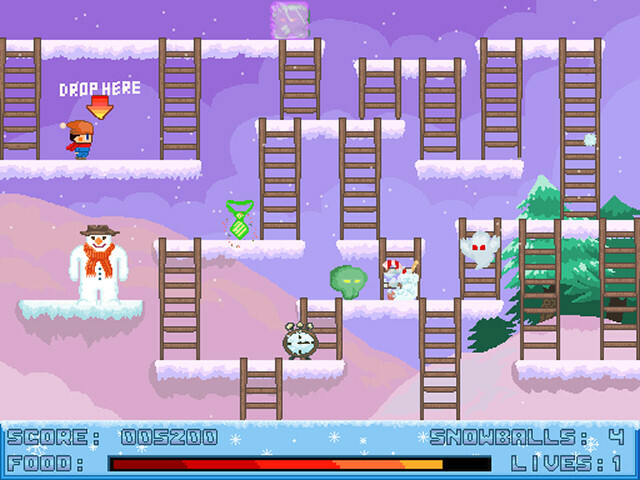 The Snowman couldn't be much simpler to play - you only need to walk left and right, and climb up and down. All the versions have the option to play on keyboard or joystick, although the C64 version doesn't say as much (although I haven't seen the cassette inlay). In the SPECTRUM version, you can choose your control method from the Options screen, while the C64 version only shows the keyboard controls on the second page of the Instructions section - no mention of the possibility of controlling the boy with a joystick in Port 1. The MSX version clearly shows the control options in the title screen already, so you don't have to search for the necessary information anywhere. The game has a plotline that goes through four stages. There are two basic types of stages in the game, which are defined by each one's type of monsters. In stages 1 and 4, you are put against flame-like creatures, which will melt any piece of snow or ice you happen to be carrying, but will not harm you. In stages 2 and 3, the sleep monsters, as they are called, will put you to sleep on touch. In either of these monster types, I couldn't detect any differences in behaviour, but the two monster types makes it necessary for you to think your movements in a different way. Although I compared this game to Burger Time, there is one rather important gameplay feature that sets the Snowman well apart: you can drop from the edges of any platform and lose one of your goes. After the four stages have been completed, you get to a new layout of ladders and platforms. There was something very irritating about this game, which made it less than enjoyable for me: your man priorises the ladders instead of the platforms, so if you climb ladders with a diagonal direction on your controller, you will continue climbing the ladder instead of hopping off in the next platform to your pushed diagonal direction. This wouldn't necessarily be much of a problem, if only you didn't need to be pixel-perfect in switching from ladder to platform and vice versa. This is mostly true for all versions, although it's the most irritating in the original due to the relatively quick movement speed. Somehow, the C64 version manages to give some more focus on the diagonal priorities, but even there, the behaviour seems to be a bit random. At least this little inconvenience is somewhat constantly present in all versions, so in that sense, the three are on a fairly similar starting level. In terms of smoothness of gameplay, the C64 is curiously the worst one of the lot, with plenty of notable slowdown when the noises interfere with the action. Since the game doesn't feel particularly complex, I would say it's quite clearly a matter of bad optimisation for the C64's CPU. The MSX version differs in a few other, rather unexpected ways: the food meter runs slightly quicker than in the other two versions, the level layouts are somewhat different, and probably the most importantly, the monsters can move at the bottom of the screen, which they cannot do in the other two versions. The monsters are also much more unpredictable and random in their behaviour on the MSX, which is not a very good change. In simple terms, the MSX version is much more difficult than the other two. However, there is one pivotal change in the basic gameplay mechanics in the MSX version: the fire button is now utilised for a rather cunning action - you can drop down and hang from a ledge to avoid monsters by keeping the fire button down. When you release the fire button, you get back up. This makes a whole lot of difference. As expected, the original works best, because it's balanced, smooth and pretty much everything you would expect from this sort of game. Happily, while the MSX version is less comfortable with its unpredictable monster behaviour, it does have an exclusive thing regarding the fire button, which makes it a bit more comfortable and perhaps even interesting. It's just not quite as playable as the original. The C64 version follows the original as far as it can, but the conversion feels like a sloppy straight port, and it suffers from occasional bad slowdown for whatever reason. As a children's story entirely made of pictures, or moving pictures, if you're more familiar with the animated short film, the feel of the drawing style and the animation has a good deal of importance. For an 8-bit computer game of a certain age, can you expect anything of that quality in art? No. But at least you get a nice title/loading screen in every version with some sort of representation of the book's graphics, if not entirely faithfully pixelated in all versions. From the three pictures above, only the SPECTRUM screen is displayed when the game is loading, but not during the title sequence. All three are nice enough for what they are, but the MSX version is the only one featuring the boy as well, in a sort of extended version of the cover art. But that's pretty much all there is to it. The Snowman itself continues to be featured in the game as well-drawn as you have any reason to expect, but everything else is left more or less to your imagination. In the two most similar versions, the menu screen is fairly stylish, with a nice multi-colour border scrolling counter-clockwise, a fittingly styled title text and two snowmen on each side of it in some pose or another, some snowfall in the background and such. The SPECTRUM original has been made with clearly more care, as you can see from the border thing actually having some sort of logic in its order of colours, as well as the customised font used for all the texts aside from the logo. The menu screen in the MSX version is very bare-bones, with only regular text in a few colours to separate the sections from each other. Left: ZX Spectrum - instructions and options / Right: Commodore 64 - instructions. While it's not a particularly big omission in a graphical sense, the MSX version is still the only one of the lot that doesn't feature instructions that could be accessed through the title/menu screen, so supposedly, all the necessary information can be found in the cassette cover leaflet. As both control methods are usable in the C64 version at the same time, there is no need for a control options screen, as there is in the SPECTRUM version. But however simple a couple of screens of instructions can be considered to make, it is still nice to see at least some effort put into them, as has been done for the original. It's not much, but it's still more than on the C64. Screenshots of two different stages from the first layout, left to right: ZX Spectrum, Commodore 64, MSX. When we get to the in-game graphics, things get more interesting, as they well should. The original SPECTRUM graphics have been almost directly ported for the C64 version, with the obvious exception in the font used in the top panel, and also, the attribute clash has been taken care of on the C64, as you would expect. That said, there's not quite as much colour in the C64 version, and as I mentioned earlier in the Playability section, the game starts to slow down quite a bit when there's more action on the screen. The MSX version's graphics have been almost completely remade, now leaning towards a more Japanese style with the cutesy ghosts and the Snowman's posture. Also, the narrower and decidedly more ladder-like looking ladders have now been drawn to take priority over the platforms, and as I said before, the layouts are now somewhat different. And still more, the boy is multi-coloured, and the enemies are all of a different colour. Screenshots of a random frame for when you literally fall asleep, left to right: Commodore 64, ZX Spectrum, MSX. 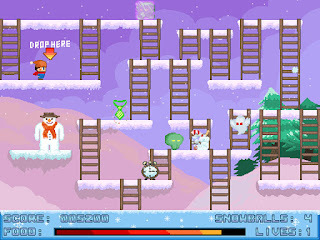 Whether this bit was made in this way because The Snowman is aimed primarily at children, or because the animation tries so hard to make you believe there really are Snowmen and flying reindeer and even Santa Claus, the fact remains that this game is one of the very rare ones, in which you don't die, but are put to sleep. This, of course, happens if you collide with one of the Sleep Monsters in stages 2 and 3, or drop from a ledge. In the SPECTRUM and C64 versions, whenever one of these occasions happens, the boy simply falls down on his bed that will appear below the stage, and once he's lying in the bed, the screen turns to black in eight steps of changing colours, and then only the boy in his bed remains. For the MSX version, they added a funny animation for this sequence, in which you float downwards while swinging back and forth in a very cartoonish manner, while an angel is moving your bed around below you to your swinging rhythm. They (whoever made the conversion) took away the colourful fade effect, though, but the swinging animation is a nice compensation for it. Screenshots from the second layout, left to right: MSX, ZX Spectrum, Commodore 64. Once you've completed the first level, you move on to the next layout, which is pretty much all that happens in the game. There are, as far as I'm aware, four different layouts to play through, and then the game loops from beginning. I haven't had the energy or the time to prove this for all three versions, particularly because the MSX version is so difficult, so if anyone has differing information, please do leave a comment. The Snowman's progression. Top row: ZX Spectrum. Middle row: Commodore 64. Bottom row: MSX. Note that the MSX version actually features a separate picture for each added ice cube - I just skipped to the end there. The Snowman goes through 16 different forms in the game. The first four are his body being built, the next six are all his decorative elements - the scarf, the hat, the nose, the coat buttons, the eyes, and the mouth; and the final six are just some more accessories that should be familiar from the story, including a skateboard and sunglasses. 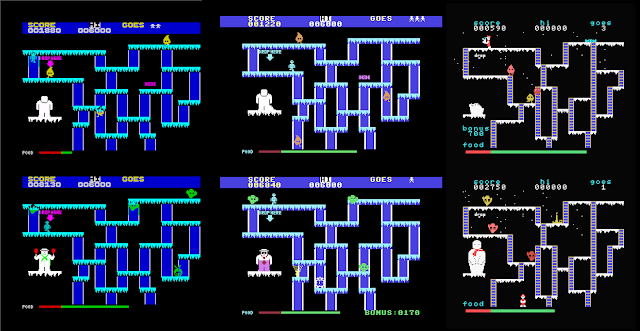 I like the way the Snowman looks as he is being built on the MSX, and his other forms have many more details, all of which have been done notably better than in the other two versions. Even the final stage has its own 6 Snowman variations in addition to the already slightly more numerous earlier forms, as there is a new one for each collected ice cube. Getting a high score + the Hall of Fame, left to right: ZX Spectrum, MSX, Commodore 64. Apart from the SPECTRUM version's flash effect around the text, the Game Over screen is of no interest to this comparison. So, we end with a set of Hall of Fame screens and Enter Your Name screens. I don't really know what to say about these, since they're all boring, and the MSX version particularly boring. Although, it does have more space to put your name in than the other two. Well, of course it could be said of the SPECTRUM version, that it's more constant than the C64 version in its style, and the C64 version is more constantly boringly amateurish. Although I'm not particularly fond of the title screens, the MSX version is overall notably better than the other two. It runs smoothly, it has more colour than the other two, and it even has a snowfall animation in the background. The SPECTRUM version comes as a close second, but the C64 version with its boring font choices, jerky animations and unimaginative use of colours puts it at the last place here. I know, "Walking in the Air" is one of the most recognisable tunes from anything ever, and should be celebrated for what it is, but our beloved Nightwish ruined it for me before I found out that it even was from this animated short film that had such a status. Call me weird, but I don't particularly like heavy metal (at least not anymore), especially when it's combined with operatic vocals. Well, everyone has a taste, but that's neither here nor there, since I was supposed to be talking about the music in the game in the first place. In the animated version of The Snowman, the song does have its place, and why shouldn't it, since it was written by Howard Blake specifically for the film. When the snowman and the boy take off to fly to the North Pole to attend a party of snowmen, the song plays as a theme for the journey. Of course, the original version is anything but heavy, and is performed by St Paul's Cathedral choirboy Peter Auty, which makes quite a bit of difference in the context. And since this song is the most well-known musical bit of the animation, it is only natural that it should act as the theme song for the game as well, even if the film had some other, more uplifting options to choose from, like that tune from the motorbike scene, or even the one from the Snowmen's Ball scene. But, oh - wait! The original SPECTRUM version doesn't feature the song, and there is no music at all in the title screen. And the same goes for the MSX version, but for the rest of the game, the Spectrum and MSX versions differ quite a bit. During play, there is no music either in the SPECTRUM version, only very bulky sound effects that you could easily expect from most other Spectrum games pre-1985. The only tune that plays in the Spectrum version is a 16-bar version of "Rudolph the Red-Nosed Reindeer", which doesn't seem very fitting at all, unless you were playing some generic winter/Christmas-themed game. Contrarily, the MSX version has a fairly musical set of sound effects. The only tune that always plays at a certain point is the second bit from "Silent Night", which plays every time you fall asleep. There are some other bits of Christmas-themed music played at every occasion when you pick something up or drop an item, but they're so short that I'm having trouble figuring out what bits of songs are played. The only ones I have recognized so far are "Deck The Halls", "God Rest Ye Merry Gentlemen" and "Rudolph the Red-Nosed Reindeer", but some of the others are awfully familiar, too. Sorry - for a musician, I'm appallingly bad at recognizing Christmas songs. Anyway, the only sound "effects" that I can think of that aren't melodic quotes from Christmas songs are 1) for when you pick up a bonus item, with which you can stun your enemies, and 2) for when you pick up a food item. The only bad thing about this sound buffet is that there seems to be nothing included from the animation. So, again it's the C64's job to save the day in terms of contextual music. Lo and behold, "Walking in the Air" is the C64's title tune. But also, "Rudolph" has remained in its place from the original Spectrum version. Naturally, with the SID chip in use, all the music takes advantage of the three channels in use. The sound effects don't differ all that much from the SPECTRUM ones, it's all just really basic sound effects that you would expect from a game made in 1984. Nothing fancy, but adequate - just like in the original. The only thing is, the C64 version is the only one to feature at least some music featured in the animated film, so in my books, that earns a win right there. Hmm. I wasn't expecting quite that. Well, as a basic rule, follow the Playability scores and you'll be alright. But I do have to say, the MSX version became my favourite one almost at the instant when I found out that you could do something in it, which you couldn't do in the other two versions. Too bad it has that unpredictability problem with the enemies, otherwise it's a nice and different version - perhaps an upgrade on the idea, if you will. The Snowman remake by Tardis Remakes (2009). If you're a fan of this game, or otherwise enjoy these kinds of games, you might be happy to know that Tardis Remakes did a very nice remake of The Snowman in 2009, and it is available for Windows-based PC's and Mac OSX. This remake differs from the original's gameplay in that you can shoot snowballs in this one, and that the bottom floor isn't available for anyone. Also, the platform/ladder problem that I have a huge grudge with has been made considerably better. And of course, it looks and sounds more modern, but it's a good option for your possible young offspring, if he or she doesn't appreciate properly old stuff. Thanks for reading, hope you enjoyed it! Next time, something very different, yet similarly thematic. Until then, ta-ta.